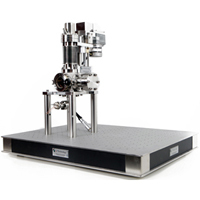 KP Technology has a sound background in scientific measurement and instrumentation, including first hand experience in the requirements of the scientific community. Our wealth of experience, from the needs of the user through the design process and on to manufacture, is invaluable to our working methods and practice. 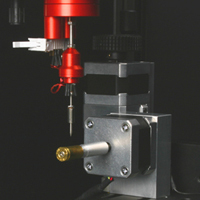 We are able to supply bespoke systems to meet the technical needs of the customer; from varying sizes of Kelvin Probe tips to completely bespoke systems. Our in-house team of experts are here to help get the right system for you. The customer wanted a bespoke SPS system using a series of multi-wavelngth LEDs. 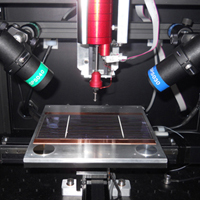 The system was designed with 6 LEDs total, 2 pairs of visible spectrum LEDs and a pair of LEDs in the UV spectrum. 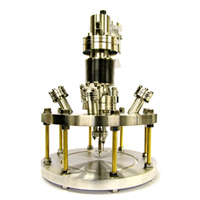 The client needed a UHV Kelvin Probe to perform their measurements at CERN, the problem they had was the positioning of the chamber relative to the UHV Probe. We designed a bespoke tip for the Kelvin Probe that allowed the user to measure the Work Function at a specific angle (i.e. not perpindicular ot the probe). The client wanted to shine multiple wavelengths of light upon their large Si samples. We redesigned our SPS and ASKP systems to do this. This gave the client the ability to perform 150mm x 200mm scans with varying wavelength and intensity. The system was to be placed insie their glovebox systems so we designed a Tri-Fold door for ease of use on the front of the enclosure. The customer had samples that had to be measured under varying gases. 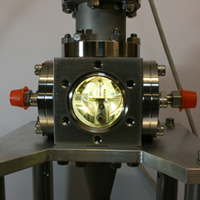 We based our design on a UHV Cell and added swagelok adapters for gas flow-through. The sample was mounted on a bespoke 25mm manual translator. 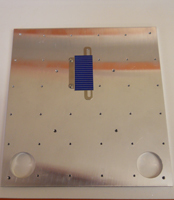 The system also contained SPV LEDs mounted inside the Cell. The customer was a Criminologist with the portland Police Department who needed to measure latent fingerprints from spent 9mm rounds. 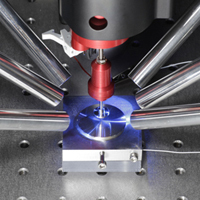 We designed and built a Kelvin Probe system that had the 9mm casing mounted on a rotational axis and scanned in 3 Axes. The Kelvin Probe tips were also designed at a dimension to pick up fingerprint ridge detail. The client is a producer of large multi-systems that require a bespoke mounting solution. 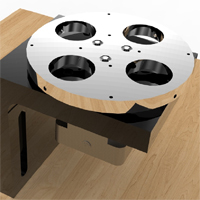 We had designed a bespoke flange with various adapters for the client. 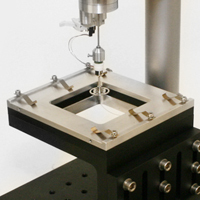 This allows them to mount our UHV Kelvin Probe onto their own system and perform Work Function Measurements. 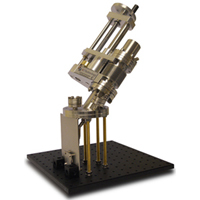 We can tailor our Sample Holders to the client's specification.Shining light from top and bottom, rotational, angled, held with spring clips, 4",6" or 12" wafers or tapped sample holders for multi-sample mounting we can do a large range. Three examples of these are below. We design Kelvin Probe tips in-house. From sizes of 0.05mm to 20mm. Sharp tip, flat tip, angled, holed, mesh. Gold, Gold Coated, Platinum, Stainless Steel, we offer an extensive selection. If you would like further information on any of our above bespoke systems, or if you have a system you would like tailored, please get in contact with us. Copyright © KP Technology 2012. All rights reserved.